• Central Texas Gun Works is conducting this sweepstakes. 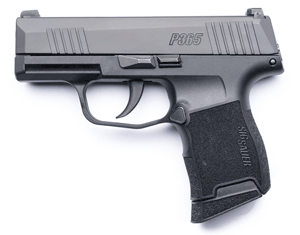 • The winner will receive a prize of one (1) Sig Sauer P365 firearm with a MSRP of $599.00 USD. • The odds of winning depend on the total number of entries received, which is not known until the submission deadline. • No purchase necessary. Purchases will not increase or decrease odds of winning. • An entry requires answers to all entry form questions to be considered complete before submission. • Only 1 entry is allowed per person. Multiple submissions by the same person will void all entries by the same person. • Employees and family members of employees are not eligible to participate. • Entry submission begins at 9:00 A.M. U.S. Central Time on Wednesday, January 30, 2019. • You must submit your entry by 11:59 P.M. U.S. Central Time on Wednesday, February 13, 2019. • We will draw at random one (1) winner at 1:00 P.M. U.S. Central Time on Thursday, February 14, 2019 at Central Texas Gun Works. • We will immediately notify the winner by phone and email at the number and address provided in this form. • The winner will have 30 days to claim the prize. A prize not claimed within 30 days is forfeited. A prize is not transferrable to another person for any reason. • The winner must claim the prize at Central Texas Gun Works in person. The winner must be eligible to take possession of a firearm in accordance with all applicable local, state, and federal laws. Central Texas Gun Works will not charge any additional fees but will require completion of all necessary paperwork to legally transfer the firearm to the winner. In the alternative, the winner can arrange for the firearm to be transferred to a properly licensed U.S. dealer with a valid F.F.L. The winner will be responsible for third-party transfer fees. Please make all necessary arrangements in advance.